Our next dates are scheduled. You must RSVP in order to attend since skate rentals at this rink are limited. This is a totally free event. If you have interest in joining the team or volunteering please reach out to one of us on the contacts page. We are excited to announce that we have a new sponsor! Mark Demontis was a kid growing up in Canada with a dream to play in the NHL. That dream was cut short after being diagnosed with Leber hereditary optic neuropathy (LHON), a disease that quickly robbed him of his vision. In 2008 Mark created Courage Canada. 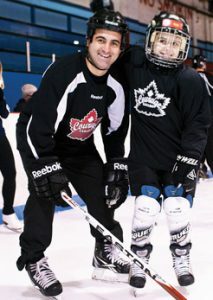 Courage Canada has now transitioned to become The Canadian Blind Hockey Association. Blind Hockey was originally invented in Canada in the 1970’s with the founding of the Toronto Ice Owls in 1972, followed by Les Hiboux de Montreal in 1976. For much of the first 40 years of the sport’s history, it was played regionally with very little interaction between clubs and no organization at a national level. That all changed in 2010 when a group of leaders from teams across the country got together to formalize the adapted rules and launch Canadian Blind Hockey (formerly known as Courage Canada Hockey for the Blind). 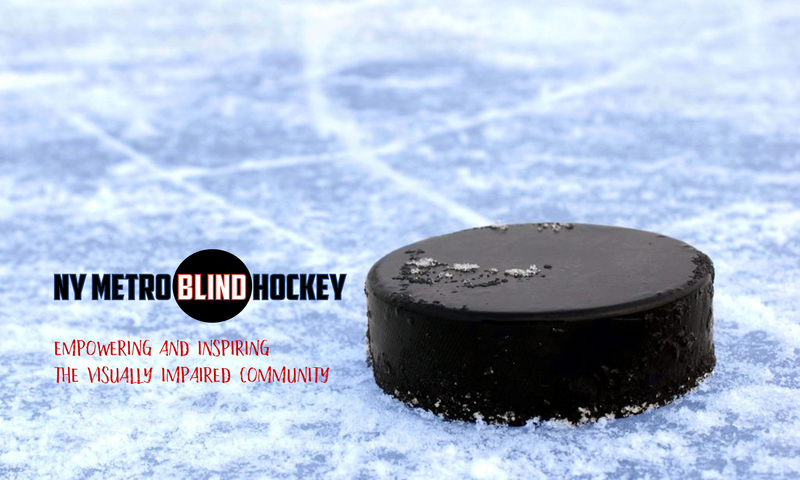 Currently there are seven established Blind Hockey Teams across Canada, and the organization operates the annual Canadian National Blind Hockey Tournament, as well as Western and Eastern Regional Blind Hockey Tournaments. 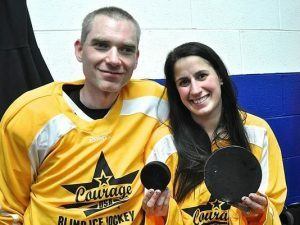 In 2014 Kevin Shanley and Christine Osika founded America’s first Blind Ice Hockey team, the New York Nightshades. It has now spread in the US with teams formed in Connecticut, Pittsburgh, Washington D.C., St Louis, Colorado, Chicago and many more cities. USA hockey has sanctioned a NY Metro area team. Come be a part of this exciting team. Players are visually impaired ranging from low vision to completely blind. Players use an adaptive puck that makes noise and is larger and slower than a traditional puck. 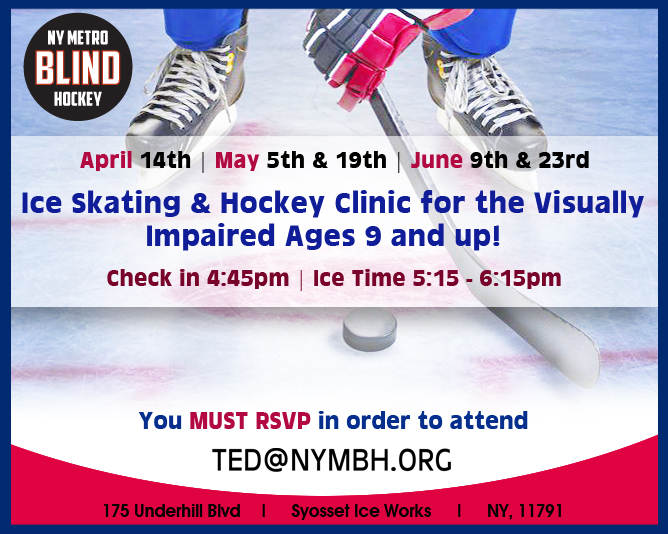 Our goal is to introduce people of all ages and skill levels to ice skating and to the sport of ice hockey, and to create a community of connected people by building up our visually impaired team for the New York Metro area. USA Hockey is working aggressively with Canadian Blind Hockey to make this an official Paralympic sport. Working together, we believe we can get accomplish these goals. Players will have many opportunities to travel across the USA and Canada with the hope to eventually travel worldwide. If you are interested in joining use one of the contacts on the Contact page. If you or anyone you know is visually impaired, please let us know by using one of the contacts listed below.